If you have a large powerful dog or one that pulls on the lead, you will know how exhausting walks can be. Dogs of all sizes can pull on the lead to the point of choking themselves. The Halti was designed by Dr Roger Mugford to come to the rescue of such dogs and their owners. Its revolutionary design is based on the same principle as a horses headcollar - if you guide the head, the body will surely follow. The Halti Headcollar makes training and behaviour modification practical and safe. It can be used as an active training aid or as a passive means to stop the dog pulling. It is made from a lightweight but strong nylon webbing with a padded leather lining on the noseband for added comfort. Each Halti Headcollar comes complete with a Halti Safety Link which connects to the dog's collar for added security. Naturally following the contours of a dogs face and positioned well down the dogs nose, the Halti gives you maximum steering power and control. The particular advantage of the Halti is its unique on-off muzzle-closing effect: when the dog attempts to lunge forward or attack, his jaws are closed by the slip ring. When he is relaxed or friendly, he can pant easily and act just like a dog. The soft material and careful design and construction ensures the Halti is comfortable and in many dogs can create a pronounced calming effect. Halti comes in six sizes in black with sizes 1-4 also available in red, brown or blue. 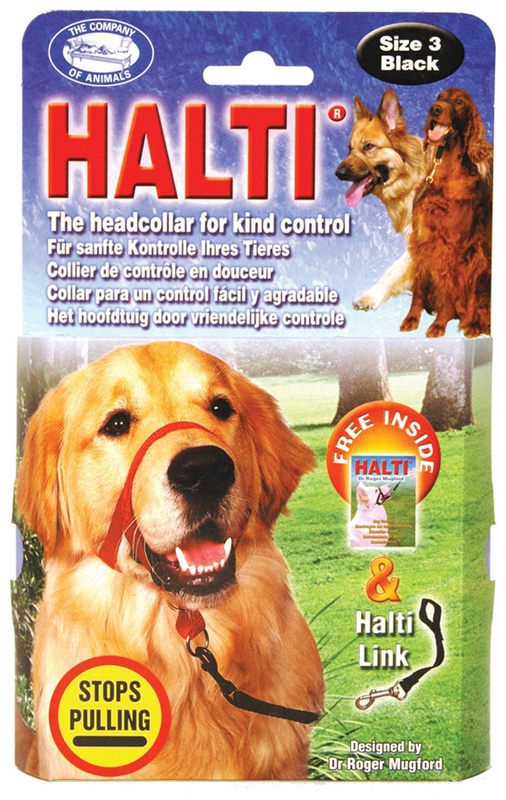 For dogs with sensitive noses such as Boxers or Shar Peis we recommend a padded Halti. Below are some recent questions we've received regarding Halti Headcollar for Dogs, including answers from our team. What are the measurements for the size 0 please?